The senior caps her fourth consecutive state title by becoming the first Maine girl to clear 6 feet in the high jump. 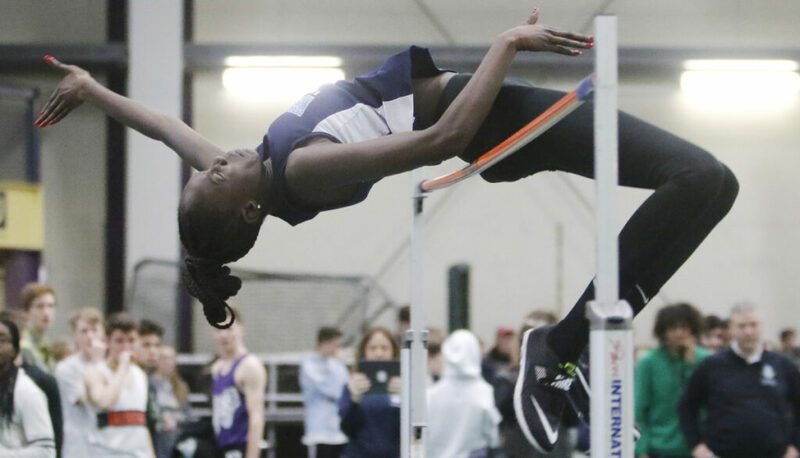 Nyagoa Bayak was in the sixth grade, a distance runner and shot putter for her school’s track team, when her coach suggested she try the high jump. From that experiment, Bayak has flourished. Now a senior at Westbrook High, Bayak this winter became the first Maine girl to clear 6 feet in the high jump. She did so while winning the Class A state title for the fourth consecutive year. In the following weeks, she won the New England high jump title for the fourth time and placed second at New Balance Nationals. And her accomplishments are just part of what makes Bayak our choice for Varsity Maine Girls’ Indoor Track Athlete of the Year. Bayak is also passing her knowledge along to the middle school high jumpers. She often attends their practices and works as a high jump official at middle school meets. Bayak has been a mainstay for the Blue Blazes since her freshman year. She gave up basketball after her sophomore year – she was competing in both sports her first two years – to concentrate on high jumping. Leaving basketball meant that Bayak could devote all her training to track. In addition to the high jump, she competes in the triple jump, which she won at the indoor state meet for the third consecutive year. She said her goal for the outdoor season is to clear 6 feet on a regular basis. Bayak has been Westbrook’s top scorer in her four years. But Lally said her impact on the team goes further than just points in a meet. Bayak’s success certainly motivates her.